Skytrain is a general term used for all kinds of elevated train systems around the world. Most of these train systems are replacements for the subway or the regular urban railways. And most of them were built on elevated tracks because the urban landscape below was already too crowded or because the soil was not suitable for subterranean construction. 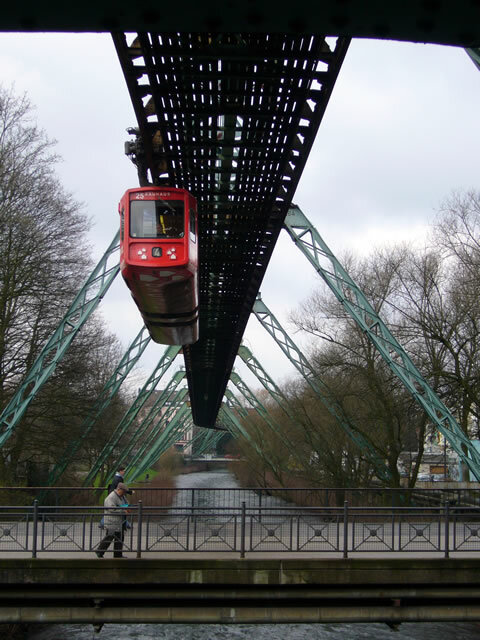 Last year I went to see a different kind of skytrain in Wuppertal. Why it’s different? Because its cars don’t run on tracks like other trains do, but instead they are suspended. In other words, the wheels of the cars are above and not below. It’s easy to see what I mean if you look at the pictures. Construction of the suspended monorail-system, which is the technical term, began in the summer of 1898 and progressed quite rapidly. A first test drive took place the same year. In 1900 Kaiser Wilhelm II of the German Empire was one of the first official visitors to go for a ride on the suspension line. In 1901 transport was opened to the public. 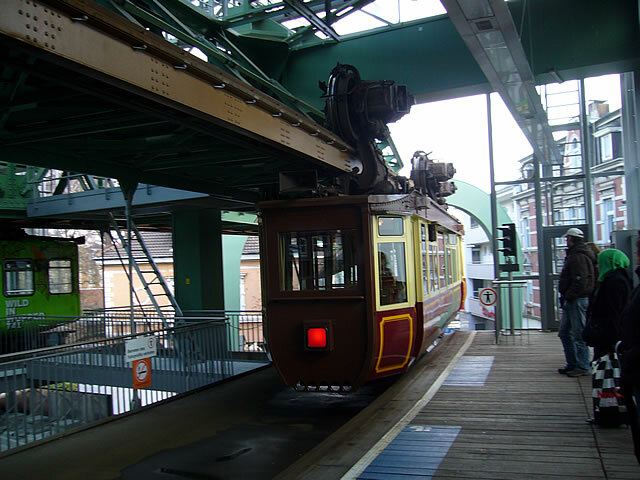 The suspension line quickly became Wuppertal’s most prominent landmark and after 100 years, it is still the easiest and fastest way to get around in the city. One curious story connected to the suspension line, which people from Wuppertal like to tell, is that of the elephant ‘Tuffi’. In 1950 a circus was in town and for promotional purposes they let the young elephant ride in one of the cars. Half-way through the trip, however, Tuffi decided this wasn’t his favorite mode of transportation and jumped from the car down into the Wupper River below. Fortunately he wasn’t injured. A much more tragic incident occured in 1999 when one of the cars crashed and fell, leaving 5 people dead and many injured. 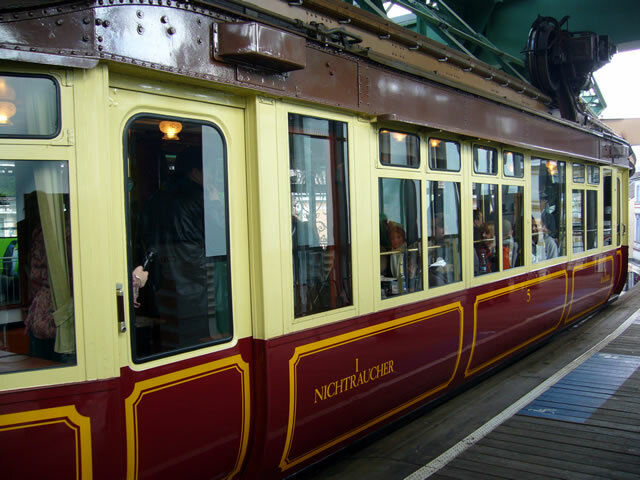 Prior to this accident the suspension line was praised as the safest transportation system in the world, with no fatality in its 90-year history. Considering the millions of travellers over the years, it is still incredibly safe, of course. Cause of the accident back then was a scrap piece of metal not removed after some construction work. The suspension line is part of the regular public transportation network in Wuppertal and tickets can be bought from machines at any of the stations. A one way ticket is about 2 Euros, a ticket for the whole day is 5 Euros. I recommend the day-ticket because you can get on and off as many times as you like. Group discounts are also available. And don’t worry, there are usually a few tourists in each car, while the rest of the people is entirely unimpressed by the ride. What is generally a good idea is to start off at one end of the line and then simply enjoy the ride to the other end. On the way back you can then get off and visit some of the other sights if you like. There is a large zoo and a lot of interesting architecture for example. Thanks for your comment, it’s always good to receive some feedback (good or bad). Much appreciated and see you around! I’ve used one of your pictures in my post: http://a-craciunescu.blogspot.com/2011/01/mici-detalii.html. 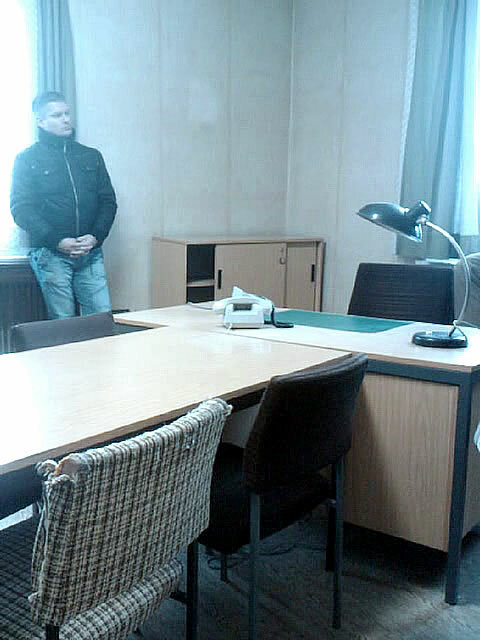 It was to debate upon the choices between subway, suspended metro or tram in Bucharest, in case of expansion of existing network. Hope you do not mind and thank you! I have never been on a sky train. It’s on my to do list. I do ride trains a lot and i love it. Looking forward to riding one of these.